How good is popcorn for you? Popcorn has the crunchy, salty appeal of chips or pretzels, but you can have three cups of the air-popped snack for slightly fewer calories than you’ll find in one sourdough pretzel. Manufacturers of bagged brands have capitalized on popcorn’s relatively healthy reputation, splashing the front of the packages with such claims as “whole grain,” “gluten-free,” and “50 percent less fat.” Many brands also boast the calorie count per cup. Even some of the popcorn brand names — such as SkinnyPop and Smartfood — make the products sound like health foods, if not outright diet aids. The food testing team at Consumer Reports set out to see how well bagged popcorn lived up to its health claims. Though you might not think to put it in the same category as whole-wheat bread or steel-cut oats, popcorn is a whole grain, which research has shown can help your health. A 2016 review of 45 studies published in the British Medical Journal found that eating three servings of whole grains per day was linked to a 22 percent reduction in cardiovascular disease risk and a 15 percent reduced risk of cancer. It’s also a good source of antioxidants, compounds that can prevent cell damage. Of course, a popcorn’s healthfulness depends on the ingredients — and the amount of them — it contains, says Beth Kitchin, assistant professor of nutrition sciences at the University of Alabama at Birmingham. A little salt and oil — or sugar in a kettle corn — may not hurt. “But if you’re loading it up, you can get into trouble,” she says. Consumer Reports looked at the original — or the most basic — sea salt variety of five bagged brands: Angie’s Boomchickapop; Cape Cod; Popcorn, Indiana; SkinnyPop; and Smartfood. 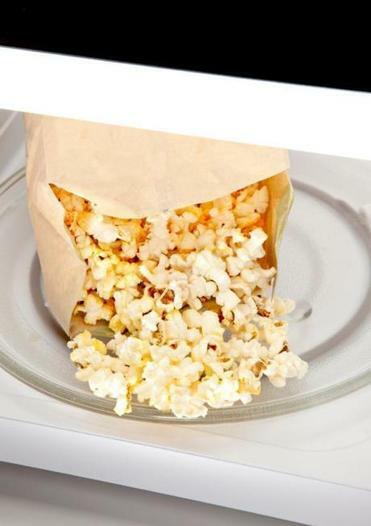 All of them had just three ingredients — popcorn, oil, and salt — and contained 70 to 78 calories, 3 to 5 grams of fat, and 40 to 117 mg of sodium per 2-cup serving. That put them in the “good” or “fair” rating categories for nutrition. The fat and sodium counts cost them a higher rating, says Consumer Reports nutritionist Ellen Klosz. Still, any of the five popcorns makes a healthier choice than chips or pretzels. For the most part, Consumer Reports’ tested popcorns’ nutritional value was in line with their front-of-the-bag claims. The one surprise was SkinnyPop, a brand that has had a greater percentage growth in sales over the past few years than its biggest competitors. Given its name, a consumer might well think that SkinnyPop is lower in calories and fat, but it actually contains more of both than the other four popcorns. All five brands performed well in Consumer Reports’ taste tests. Angie’s Boomchickapop Sea Salt snagged an “excellent” rating for its toasted-corn flavor and crispy-crunchy texture. Cape Cod Seaside Pop Sea Salt even had a tasty flavor similar to that of unbuttered movie popcorn.